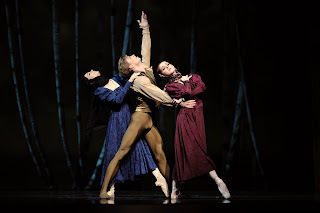 Dance Commentary by Heather Desaulniers: "Onegin"
Maria Kochetkova and Vitor Luiz in Cranko's "Onegin"
An evening of choreographic and artistic brilliance awaits at San Francisco Ballet's production of John Cranko's "Onegin". A superb choice to open the 2012 season, this full-length narrative ballet is a multi-layered composition that combines risky choreography and infinite thematics (thus appealing to both the traditionalist and the modernist). "Onegin" tells the story of Eugene Onegin, a gallant man whose visit to one village changes the course of many lives: his friend Lensky, Lensky's fiancée Olga, her sister Tatiana and also himself. Infatuation, tragedy, romance and selfishness plague the four primary characters throughout the three Acts, and as the curtain falls, the true message of Cranko's masterpiece becomes clear: do-overs are few and far between and the deep sadness and pain from previous actions can live forever. You may be able to move forward, but are still without reconciliation or resolution - your reality being not as you hoped because of consequences from long ago. Act I is all about expectation. As the curtain rises, a family of women are revealed and in these opening moments, we come to meet the two sisters, Olga and Tatiana, who are each anticipating what their respective futures may hold. Olga, danced by the delightful Clara Blanco, is engaged to Lensky and has the giddy, hopeful, elated demeanor of any bride-to-be. Tatiana is quite the opposite, displaying a inner solitude and romantic imagination found in the pretend world of her books. Lensky arrives, bringing with him his dashing friend Onegin, who, for Tatiana, becomes the flesh and blood manifestation of her fantasy. In their first pas de deux, she is literally being swept off her feet in a series of breathtaking fan lifts and as she bourées towards her ideal, the tiny, quick steps are the epitome of exhilaration. SF Ballet in Cranko's "Onegin"
Act II brings the story to a place of reality and a harsh one at that. During Tatiana's birthday celebration, Onegin (Vitor Luiz) commences a dangerous game of flirtation with Olga. Those around him are deeply affected by his indifference and thoughtless cruelty, and Lensky (Gennadi Nedvigin) reacts by challenging Onegin to a duel. Nedvigin's solo prior to the duel was one of the most thrilling moments in the ballet. The movement was so infused with reflective emotion, almost as if the character knew this was the end. Cranko choreographed an incredibly difficult variation for this dramatic moment: all of the pirouettes finishing up in relevé passé and the posé arabesques followed by a pull into deep plié. There was such suspension and tension in these steps; Lensky trying desperately to hold onto hope, yet knowing and eventually giving into the fate that would likely befall him. The constant switching between en dedans (inside) and en dehors (outside) turns also provided a physical depiction of his internal turmoil. Nedvigin was fantastic and heartbreaking - I had eerie chills by the end of the sequence. We come to "Onegin's" final Act to experience how the regret of the past still abides in the events of the present. Onegin once again encounters Tatiana; she has moved on and is now married to a Prince. The two meet for one last time to tell each other their truths - he of his love for her and she of her resolve to keep to her marital commitment. Vitor Luiz and Maria Kochetkova as Onegin and Tatiana then dance their ultimate pas de deux. Filled with constant spinning and abandoned lifts, this duet tells of longing, detachment, sorrow and inevitability. Yet, the most revealing moment was as they stood still hand-in-hand facing out to the audience - a tragic resolution, yet really, the only way their union could have turned out. Performing any role in a John Cranko ballet requires an intense commitment to the combination of flawless technique and emotive depth. SF Ballet's "Onegin" reveals Maria Kochetkova as one of the great dance actresses of her time. Kochetkova has a natural dramatic ability - she can move the audience with the forceful accent of an arabesque penchée, the lowering of her arm or with one simple glance. She looks equally at home as the innocent young girl of Act I, Scene I or as the mature, regal princess of Act III. No matter the movement or the scene, Kochetkova pulls you in and makes you akin to her character's journey. Maria Kochetkova is starting to become one of my favorite dancers. I was amazed when I saw her perform live in Costa Mesa. "TAO: The Art of the Drum"